Awesome scenery. But the camp ground can get very busy. The site are ok in size but some sites are very close together. There are showers and flush toilets if you are into that. To get to the lake from the tent sites you have to climb down a pretty steep rocky hill or drive to the day use area. We fish for catfish and have caught a few here but also got skunked a few times. I've stayed here June July and October. Dont really recommend fall really windy cold and rainy. But not not many campers that time of the year. The lake is beautiful as all the Rim Lakes are. The terrain for the sites is very rugged. The lake requires a downhill hike of less than a mile but the way back up is strenuous for most, especially if you are carrying a boat. If you have an ATV, I highly recommend bringing it. There are 6-8 campsites above the lake but if you boat to the other end of the lake you can also pitch a tent there (which I have yet to do). Because the lake isn't easily accessible, it's usually pretty quiet here and you'll only see some ATVers or fishermen and women. If you want to make use of the lake by meeting the challenge of getting watercraft down and back up, then camp at this spot. Otherwise, it's a long way out just to camp 3/4 a mile away from a lake. The campground is free and you can stay 14 days, they offer a nice spot with a picnic table, grill and possibly a fire pit. Sometimes working bathrooms but they worked when my husband and I stayed. Pretty view right near the lake, fishing and when the weather is nice you can swim too! On rainy days the top spots get really muddy and kinda flooded. Nice paved road access but spots are on dirt (upper) or pebbled (lower - better when it rains and is right near the lake). We would definitely stay here again. Camp host very nice. No water, sewer, electric or WiFi but signal on my phone was perfect (Verizon). Fool Hollow is right on the outskirts if Show Low. You literally drive through neighborhood streets to get to the entrance. The first ¼ mile of roads within the park, you also drive along a fence that backs up to private properties. Do not let that “fool” you though… when we got to the Osprey loop within the campground you would have had no idea town was so close! The scenery is a mix between forest and high desert. There were plenty of pine trees but still the occasional cactus. All of the roads through Fool hollow are paved. There are plenty of dumpsters and trashcans available. The spaces in the Osprey loop were fairly close together. We had loud neighbors and heard them all night long. This surprised us because the Quiet Hours are 8 pm to 7 am and we were right across from the host but they never said anything. That being said we saw the host drive by once or twice in the entire 3 days we were there. In fact, when our not so friendly neighbors left on day 2 they left the site trashed. The host did not come to clean it up until day 3 after another camper had stayed in the site and complained about it being dirty. Another notable item for Osprey is that while the spaces appear to be waterfront on their website there is a 20-foot drop off between the sites and the lake. I think this is worth mentioning in case you have small children or actually plan to go to the lake. I know our pictures show us in a pop up trailer but this summer Fool Hollow updated their policy and pop up trailers are now considered “RVs” and cannot be in the tent only sites. We were grandfathered in to the space because we already had reservations but if you plan to visit with a pop-up be sure to book in an RV space. Fool Hollow boasts some of the most modern bathrooms I have seen at a campground. There was a coke vending machine and an outside sink. Our building had three women’s and three men’s bathrooms. For each gender, two also contained showers. I did not use them because it was really cold and there is no electrical to run a blow dryer so I didn’t want to be stuck with wet hair. However, I did see campers use them and after talking with them, they said they are always hot. Unfortunately, if hot is not your thing there is no temperature dial on the shower so you are stuck with the water at whatever temperature it comes out at. The bathrooms were well lit all night. So much so that if light pollution bothers you I would not suggest getting a space near the bathroom. As a Ranger for The Dyrt, I get products to test from time to time – on this trip I tested the RoM Women’s Altitude Hydration Jacket. This jacket in particular is one of the prototypes that RoM had. From what I was told the sizing on them will be a little off from the final product so I do suggest reaching out to customer service if you have questions on sizing. With the prototype I chose a Women’s Extra Large. I’m around 5 ft 8 in tall and wear an 8 or 10 in women’s jeans. This jacket was an excellent fit on me in the torso, arm length, and overall sizing. I had just a little free space around the hips and was able to move freely without it being too big. The jacket’s unique feature is that it has a built in hydration pack holder that routes through the jacket. I thought this was going to be one of my favorite features but it ended up being the thing I disliked the most about it. The hydration bladder sites on the inside of the down layer so if you have cold water in it you then have a cold hydration bladder only a thin layer of material away from your back. This seemed a bit counterproductive because the jacket is WARM and if you need a jacket that warm you likely do not want something cold pressed against your body. When the hydration bladder was full it also pulled down on the back of the jacket and kept making the front ride up. The drinking tube routes through the left side of the jacket and cannot be routed through the other side. Generally speaking you shouldn’t put warm liquid in those bladders but you could use the pocket for a hot water bottle instead. Again, you will be battling the weight but it may keep you that much warmer. The jacket was extremely warm. When we arrived, it was in the upper 60’s and the winds were around 25 mph. My clothing was warm enough but the wind was cutting through so I decided to put the jacket on. I ended up in a tank top under the jacket and it would still get warm enough that I’d need to take the jacket off periodically to cool down. It got down into the low 30’s and I was comfortable wearing this jacket with a long sleeve shirt underneath. As far as wind resistance, this was probably the jackets best feature! The sleeves and hood can zip off and I was worried that the wind would still come through the zippers. They have put this awesome rubber cover over the zippers and no wind got through at all! The inside of the jacket has four small pockets. Three of these pockets have no closure at all (no Velcro, snaps, or flaps). They are also not very large. I’d imagine they’d work great for a chapstick, small wallet, etc. The fourth pocket has a material flap closure but nothing to secure it with. It was large enough to fold up the hood when disconnected but then there was a lot of bulk in the chest of the jacket so I did not use it like that for long. The sleeves have Velcro around the wrists to tighten them as needed. The Velcro seems to be of a good quality and should not get fuzzy after repeated use. One thing I would have liked to see on this jacket was something to tighten down the hood around the face. With all the wind I had the hood blown off quite a few times because there was no drawstring or bungee around the face. RoM’s website does not specifically state the jacket as being waterproof but makes mention to wearing it in the rain so I figured I’d test it out. I made it about 10-15 minutes in the sleet/snow before I started feeling the moisture seeping through on my shoulders. The shell is Polyester and seems a little water resistant but I would definitely not call this jacket waterproof. There were a few loose strings around the jacket where it looks they had finished seams and did not tuck the tail in so I cut them off and had no issues. The only seam that seemed to “fail” was the one on the bottom of the right exterior pocket. When I was unzipping it the zipper it went through the stitching at the bottom and came off the track. It is an easy fix and with a few stitches at home it won’t be a problem again. The jacket doesn’t have written washing directions but does have the symbols for Machine Wash Cold and Lay Flat to Dry. I ran it through my washer on a cold cycle and laid it out to dry. It took about 24 hours to dry out completely. All of the down filling seemed to stay well in place and there was very little “balling” or “bunching” in the sections. Overall, I am happy with this jacket as a cold weather jacket (especially if there is going to be wind). It was very lightweight and easily kept me warm into the 30’s. If you are looking for a waterproof outer layer I would suggest passing on this jacket because it really did not hold up to extended water exposure. Also, while the hydration pack was a great feature in theory it isn’t set up in a way that made wearing the jacket while the bladder was in very comfortable (because of it pulling the jacket backwards) or warm (because of the cold water being near your body). I may just end up using the hydration bladder pocket for a few light snacks or my wallet when I am out. I am just like everyone else, I LOVE a good FREE campsite and along the way I have learned about so many of them, but in two trips by this one I didn't know it existed then BOOM there it was and I suddenly questioned how I had passed by it and never known! Sure like all good campsites which are free there are a few negatives, this one being that there are ZERO amenities. NONE!!! But when I had attempted to camp in the petrified forest there weren't any there either so no big deal. So how did I miss it?? Well upon first glance it just looks like a picnic area with some covered tables next to a gift shop and there isn't a welcome wagon just rolling out to say "hey come stay here". it is one of those places you have to know is there to know it is there if that makes any sense. A fellow traveler told me about it and when I glanced I noticed some boondockers there but then upon a more careful evaluation there were tent campers in the distance. SCORE!! If you aren't able to camp without then this won't work or you at all, but if you are ready for an adventure then here you go, close to the park and perfect for getting in those early morning sunrise photos. We always wonder how they do it… well this campsite is a BIG reason some of the photographers are there for those amazing money shots. Come prepared, you won't have a store with all your extras until you get into Holbrook so be ready for anything. Don't get to close to the residents, they give you the stink face but you have every right to the land, if you don't believe me, do your research on the BLM website! Take your camera, you will want to make sure you get your late evening and early morning shots that are once in a lifetime. This is a small very primitive, four space campground off the beaten track. The three nights I stayed here in September, I was the only overnight camper. The place mostly seems to be a parking spot for day trips down to the lake--although even that consisted of one or two parties a day. The pit toilet was a bit stinky and the one side was piled high with trash (really people? ); like I said, way off the beaten track even for maintenance crews. The silence here was stunning-- only interrupted by the bugling of elk. Stopped here on my grand Route 66 adventure this summer. I really liked this park for several reasons. 1. It’s convenient to Route 66 (and Hwy 40); 2. 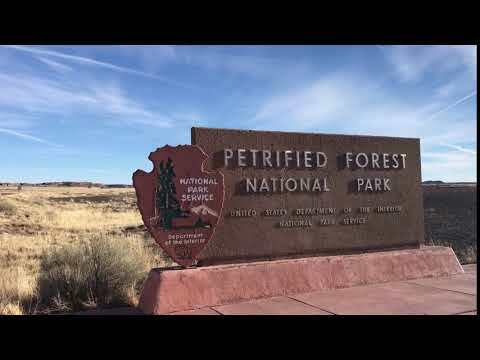 It’s close to Petrified Forest National Park, which is pretty cool to explore on its own; 3. Free showers!! ; 4. The campground is set back from the main park so you have a bit of privacy from day trippers; 5. Tent sites were level and well maintained (mine was raked!! ); 6. All sites seemed to have hook-ups whether you needed them or not (maybe there were tent only sites, but it was all one price so no big deal); 7. The park has some great trails for hiking; 8. There is ancient pottery shards everywhere (don’t take it! Leave it for everyone to enjoy); 9. Free showers!! ; 10. Not too far from Winslow, AZ, where you CAN stand on the corner. Overall I enjoyed my stay here, though I got in at sunset and left shortly after the main park opened at 8am. This might be my only negative about the park. The main park and the best attractions don’t open until 8am (a ranger actually comes and opens the gates), which is much later than I tend to get moving (up with the sun and all). And with the heat of the day starting at 9:30, it’s hard to get to the sites and get in a good hike before it’s too hot. This campground is great if you’re trying to check out the Petried Forest! The campground is clean and the staff are friendly. We stayed in the two person cabin with a bathroom. The bathroom looks like it was just added and it’s really nice! It is a walk-in shower so it is handicap accessible. The campground also offers an all you can eat pancake breakfast that is great. Would definitely go to this campground again. While this site might have very few tent sites, they do accommodate the average tent camper, and at a very reasonable rate. I was very pleased to have found this site after being told about it because of its proximity to several Route 66 stops we were making in the area. I had tried another campground and been very happy with it previously but also wanted to try something a bit different this trip. We pulled in kind of late but still were assisted in finding one of the sites and given a complete idea of the entirety of the campground which included a laundry, nice restrooms and bathhouses and a petrified wood display right out front. We were settled int he Yellow Row in a small tent space just across from the restrooms which are handicap accessible. It was a great spot just enough room to move in and out and since we were the only ones staying there in a tent it made for a pretty nice space. If there was more than a couple I could see how it would be to crowded. Call in advance to see if they have openings because sites are limited. *Speak to the office about all the cool things there are to do along Route 66 in this area, they had a map when we were there with some things I wasn’t aware were nearby. This KOA has lot's of space, from private tent sites to RV with full hookups, fully equipped cabins, even a giant Wigwam to stay at. It also has a pool, playground, small libary, and a well stocked store, everyday they cook food that you can buy instead of cooking yourself. 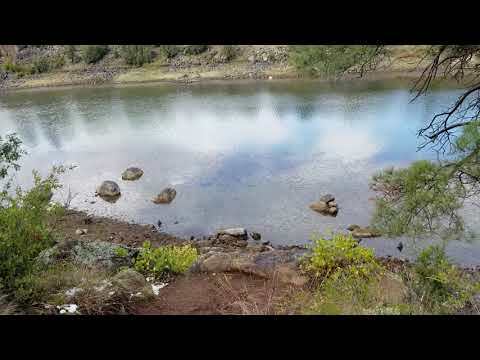 This KOA is in the route 66 town of Holbrook, a small quiet town, with gas, groceries, and fast food all with in a mile of the campsite, the Petirfied Forest is a 30 mintue drive away and worth the trip. During this trip we took a big family group, and normally we tent camp, but we decided to stay in their biggest cabin, it was big and beautiful 3 a/c units, full small kitchen, loft full bathroom and lot's of comfy seat's, all you had to do was bring your clothes and food, everything was there for you. From the gas grill to the fully equipped kitchen, it was a super easy stay. This cabin slept 7 and had a eat in porch as well. It was a little on the pricey side at $160 a night but we felt worth it's price.Check out the video for a video tour of the cabin. 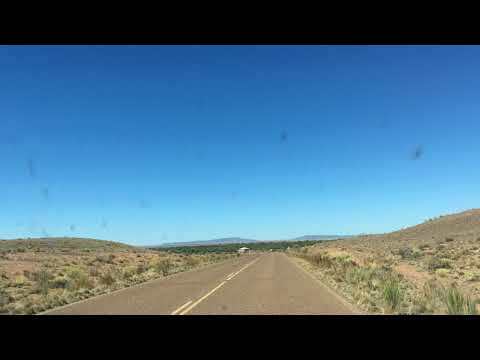 High desert, lots of sky and land, shards of ancient Hopi pottery everywhere, 52 sites some pull through, back in and tent sites, 30/50 amp available,dump station and potable water station, free showers and restrooms. On site Camphost, Homolovi I a d Homolovi ll nearby, rangers available from 8-5 - 7 days a week. Stargazing night at the ranger station with telescpe, 1880s Mormon cemetery within view of San Francisco Peaks and little Colorado River. A gem in the desert. We really enjoyed this campground. We did not need a reservation in June when we went. They had plenty of available sites to choose from. The site we chose was site 16 which is a primitive site. If you walked up the hill a bit you could see Winslow, AZ, which was really pretty at night. The park is still gery dark though so you could see the stars. I’m sure if we had been there during a new moon, we could’ve seen the milky way it was that dark. Our site was very nice. The tent pad had been raked, which was something you don’t see every day. It alwo had a picnic table and fire ring. There are not a lot of trees at this campground which may deter some, but if you are just there for an overnight stay like we were, there was no need for trees. They have new ones planted by each site so someday there will be shade. They have a shower house, but we did not use it because it looked like it could use a good cleaning. The restrooms were ok, but could’ve used a cleaning as well. It seemed odd to me that the tent pads were raked but the bathroom stalls weren’t clean. Still, it was better than a smelly outhouse so I can’t complain too much. Coming from the humidity in the midwest, we really enjoyed the lack of moisture. It was plenty hot during the day, but cooled off nicely in June. Cool dry air is perfect for sleeping and we got a great night’s sleep. Be sure to go to bed early because the sun rises early and it gets hot fast in the morning. This campground is in the Homolovi State Park which was very interesting to take a look at while we were there. The visitor center is stunning…be sure to check out the bathrooms there! They are pretty awesome for a state park visitor center! The ruins may not be national park quality, but they are close. We had the place to ourselves which was kinda neat. It was so peaceful I could’ve just sat on one of the benches at the top of a hill for hours taking it all in. If you want a relaxing and peaceful campground and state park to visit, I highly recommend this one! One other point to note is that Winslow is only about 7 miles away and they have a Walmart for supplies, as well as a few fast food places. You can also visit Standin’ on a Corner Park and some Route 66 stops. Overall, we enjoyed our time in this wonderfull desert location and would go back to camp again! In my second trip to the Petrified Forest and Painted Desert we wanted to explore the opportunity to try a little dispersed camping. We checked out the park and inquired about permits, which are free and were ready to take on the adventure head on. What we were not expecting was the WIND!! Lots and lots of wind!! In this area there are not large ares of coverage from the elements. Very minimal in fact so it made it a bit harder than we had thought it would be in selecting an area we felt comfortable even attempting to make a home for the night. On other trips to the same location we have had wind but never like this! Since there are no barriers to block it camping cannot be comfortably done in these conditions. We opted to throw in the towel and try again next time. What we did gather from this however was that the park staff is very friendly and helpful in regards to setting up your adventure and issuing permits. The park itself has sites to numerous to list that are of interest for doing this style of camping. And the biggest one of all, without camping you CANNOT get sunrise or sunset pictures because of opening and closing times of the facility. Bring a headlamp because it is a true dark sky when you are camping here, you can see nothing at night!! This is by far my favorite lake campground and one of my top 3 overall campgrounds. The camping spots are large and clean. The bathrooms are always clean and the showers are hot. There is a biking/hiking trail around the lake that we love to spend time on. You can fish too. Plenty of bird and wildlife watching. We love to take our canoe and hang out on the lake. It has a remote feel, but is close enough to a Walmart in case you need supplies and an urgent care in case of emergency. It's definitely worth the cost of camping here. Spacious campsites with some overlooking the lake. The camp store rents canoes and kayaks. Quiet hours are strictly enforced. Entire campground was clean. After we paid the park entrance fee ($16, I think), we picked up our FREE back country permit from the visitors center first thing. There we were told we were going to be the only people in the desert that night. After we did all the road side attractions by car, we headed to the trial head at the Painted Desert Inn. About 1.5 hours before sun set, we backpacked into the Painted Desert from the Inn visitors center where there is water and toilets available. The trail that goes down about 200 feet via switchbacks then ends in a magical lunar landscape of red dirt and petrified pieces of tree. Once you get to the end of that trail, you just have to walk 1 mile in any direction to camp. We hiked a for about an hour across amazing desert-scape and found an incredible plateau to camp on top of. We had a fantastic view of the surrounding dessert without being able to see any man-made structures! While it is definitely back country camping with no water, electric, toilets, defined sites or anything, it is the most amazing camping I've ever done! There's no light pollution so seeing the stars and the milky way is is no problem. It's so quite, my husband said all he could hear all night was his tinnitus. It was beautiful, magical and remote. I would go again and again. There's so much to explore and so far you can go. We even found out you can bring your dog with you in the desert! The only downside is you have to pack in all your water with you, making a multi-day trip a little harder. You can see the Milky Way (it was my first time seeing it). You can bring your dog! 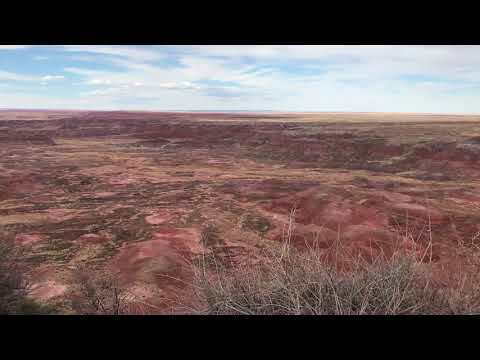 You should camp in the Painted Desert. Seriously, do it!! After driving some 3 hours from our last destination and exploring the Petrified Forest and Painted Desert in the harsh wind, we were exhausted upon pulling into our campsite at Holbrook Petrified Forest KOA. Seeing how windburn we were from the journey, we were offered an upgraded "super tent" site upon our arrival for only a $5.00 charge. The appeal was such that we jumped on the opportunity. To those unfamiliar with KOA campsites, they offer a variety of options for campers from primitive camping to improved campsites for both tents and rv campers. Super tent sites include electricity and runnin water as well as private yard area for campers. At this particular site it offered a wind shield fence and private treed yard which made for a much more camp friendly experience after the long day. We had neighbors on the other super tent site which were delightful and we greatly enjoyed conversations with them throughout the evening. The campground was filled with friendly faces! Perhaps one of the most exciting features for us after such a long cold journey from our previous campsite was the amenities throughout the grounds which included a cook station open to the public and heated bathroom and shower facilities. The grounds were well kept and easy to navigate by foot. In the evenings and mornings there was a cook on duty which offered everything from hot dogs to New York strip in the evening and all you can eat pancakes or other breakfast items. All in all we give this site a 5 of 5 Bunnies because of the cleanliness, friendliness and overall amenities. There were no real areas of improvement we could see to make our stay better! This campground has 6 sites which each have a fire pit (with grill piece), picnic table, and room for 1-2 vehicles. There are two pit toilets on site, no water, trash service, or electrical. There are no fees to camp here. The campground is located at the top of a road that leads down about 0.8 miles to Lake Chevelon. The road from the campground to the lake is closed to motor vehicles, although we did see some small off road vehicles able to bypass the gate. The climb is pretty tough on the way back up, even though it is less than a mile. The campground has several tall trees which provide some shade, but not dense coverage. The road to the campground is gravel and dirt. When we visited, all the sites filled up but I believe it is usually less crowded. Due to forest closures at the time, it limited the other areas available for camping. This place is so peaceful. You can see the mesas in the distance. It's not far from Winslow or Flagstaff. But it's nice and quiet there. It has a wonderful feeling. There are many artifacts so remember to leave no trace and not move or remove anything. Free, kitschy and convenient to Petrified Forest. This is BLM land, so it is free to camp here. There are picnic tables with covers, and cement pads at some sites. If you camp close to the permanent resident on the other side of the fence she will grouch and swear at you so there is that. The smell of cow poo is strong at times. But if you're going to the Petrified Forest this is THE place to stay, as it is close and conveniently located. Can't beat free either. I've stated here twice now and my kids love it. Big pieces of petrified wood on site you can touch and sit on even. Car camped here overnight and drove into Petrified Forest National Park in the morning. There were a few other cars and campers there, and there was easy access to water and plenty of parking spaces. The gift shops open at varying hours themselves, but it's best to leave a day or two to fully explore all this underrated park has to offer! Lots of interesting relics from the 50s and 60s in the gift shop area itself. 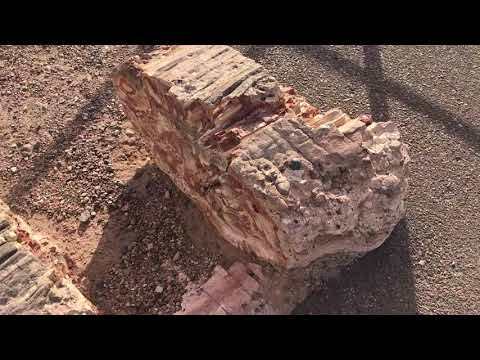 Homolovi State Park and Ruins….Ruins of the 'Ancient Ones', the Hopi. Land of Little Hills. A Galaxy of stars in the dark skies at night as you snuggle under your sleeping bag the cool desert breeze across your face, the howl of coyotes in the distance. Free use of showers and bathrooms after driving the I-40 , large spaces for the motorhome with FHU, a dump station, potable and drinking water available, dumpster for trash. Easy pay after 430pm on site. Then there are the ruins at Homolovi l and ll, Winslow a quick 10 minutes away, little painted desert over the hill, Petrified Forest and Holbrook East on I 40 about 20 miles away, Meteor Crator I 40 west about 15 miles away. Then there are the San Francisco Peaks in the distance. How can you go wrong with a stopover here. Site 39..FHU and dump at this site. We added in Petrified Forest National Park at the last minute and needed a place to stay. We arrived after sunset, showered with hot showers, kids played at the playground, enjoyed pancake breakfast the next morning. The site was basically a gravel parking lot with picnic table. We were in a camper van and the hum of RV ACs was very loud. We were hot, even after night fall, but it got them job done. If I had known there was camping closer to the Natinoal park, I would have done more research and stayed there. Oh well. Stayed in a cabin here and had a terrible time. Nothing like getting rained on due to a hole in the roof of the cabin. I had cabin H. We also got woken up by people trying to get into the cabin. I can't blame them the cabin didn't have a letter clearing marking it as cabin H. Also we had a hard time finding the cabin in the first place due to signage being wrong. Shrubs are grownup were it is difficult to get to the door of the cabin. I also heard one of the maintenance people talking about some cabins that the hot water heater wasn't working correctly. If you run into trouble don't expect help or understanding from the manager or staff. While writing about my experience on other sites i kept wondering how these folks got good reviews in the past. then i saw a post dated around 2 months ago saying that they had new owners. so be forewarned.